As with all project, we hit a few snags, but we regrouped quickly to revise the plans as needed and start our installation. We greatly appreciate the Beaufort Fire Department for providing lunch—no one went hungry! A special thanks goes to Jeff Mackey with Ferguson Fire & Fab, Inc. for overnight shipping materials to us in Beaufort! The CSRA Chapter had a joint meeting with the Columbia ASCE Chapter on December 17, 2014 at the Brookland Baptist Church’s Conference Center. 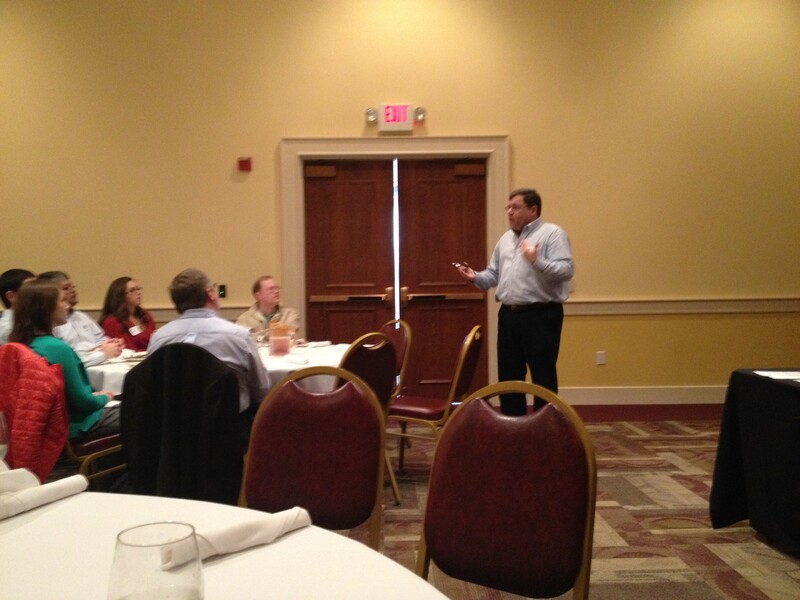 Ralph Foster made a presentation about fire protection underground piping. The presentation detailed the requirements in NFPA 24, Fire Sprinkler Specification Sheets of underground piping, and the requirements of the State Fire Marshal’s Office of plan review. Civil engineers frequently get pulled in to the plan review process when a utility contractor installed the underground fire protection piping as allowed by the Sprinkler Act. Utility contractors don’t generate shop drawings but install the piping based on the engineer’s drawings for the project. Making the engineer’s drawings the only drawing for the SFM to review. Ralph Foster taught his second class this year for the Florence area code officials on reviewing sprinkler shop drawings. The 6 hour class covers basic topics from how to use an Architectural Scale, to reading shop drawings and reviewing hydraulic calculations. The class is a mixture of lecture and hands on review of actual shop drawings, hydraulic calculations and seismic bracing calculations. The class is provided free of charge to the local officials. Ralph said, “I know AHJs have very small training budgets and I want to give back to the folks who helped me while I was working with the State Fire Marshal’s Office." Ralph donates his time and expenses for teaching the classes. 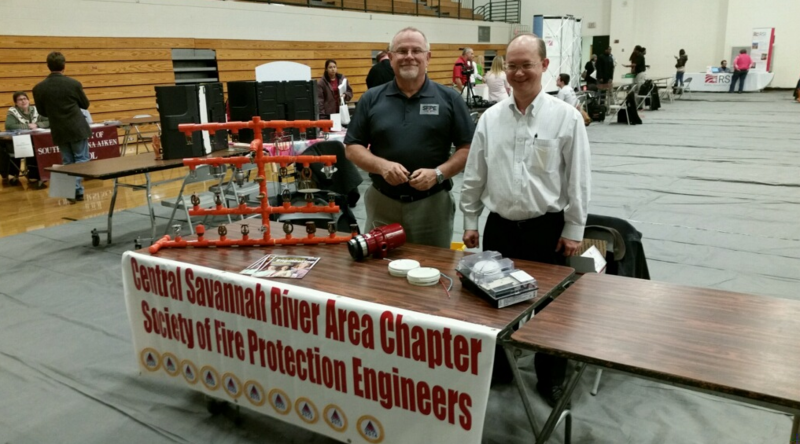 Stan Maciaszek, Mark Legrand, and Willy Ramos represented the CSRA SFPE Chapter at the Aiken High School Career Night on December 8, 2014. Students and their families attended to learn about different career clusters, including communications, finance, health science, public safety and natural resources. Stan, Mark, and Willy informed the attendees about the responsibilities and careers in Fire Protection Engineering. Ralph Foster, Stan Maciaszek, and Jamie Patterson were awarded the SFPE "Hats Off Award" in recognition of their exemplary work in leading the Chapter Project in which a fire sprinkler system was added to the Silver Bluff (SC) Fire Department. The system is not only a functional fire sprinkler system, but is also used as a teaching tool by the Fire Department. 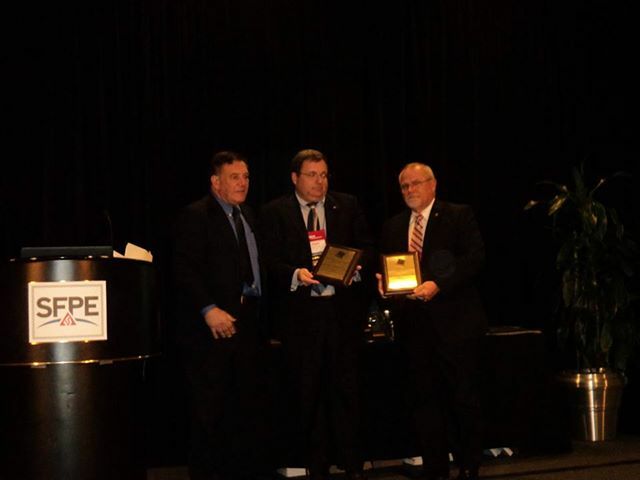 Shown are Ralph and Stan accepting their plaques at the 2014 SFPE International Conference and Expo in Long Beach, CA. Jamie was unable to attend. Congratulations, gentlemen, on a job well done! Bernie Till, Stan Maciaszek, and Jason Butler attended Paul Knox Middle School on October 31, 2014, for several fire protection classroom demonstrations. Fire science experiments were conducted and information was presented to the students about the field of Fire Protection Engineering. 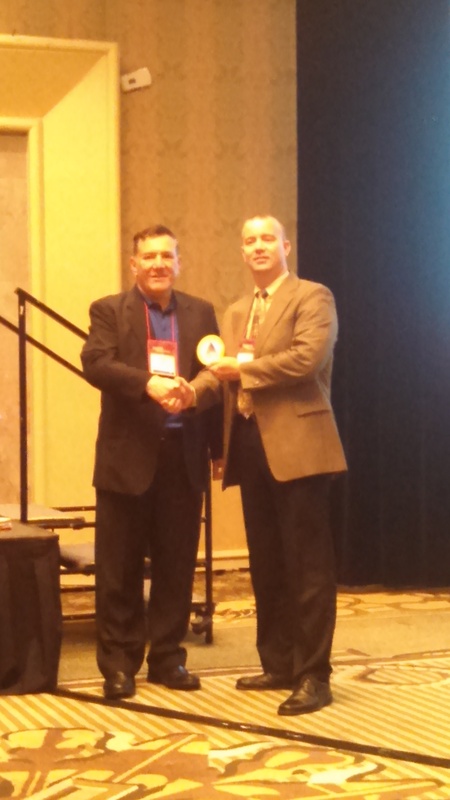 Paul Anslow attended the 2014 SFPE International Conference and Expo in Long Beach, CA to accept the 2014 SFPE Gold Level Chapter Excellence Award. This year marks the 10th consecutive year our chapter has received such recognition from SFPE International. 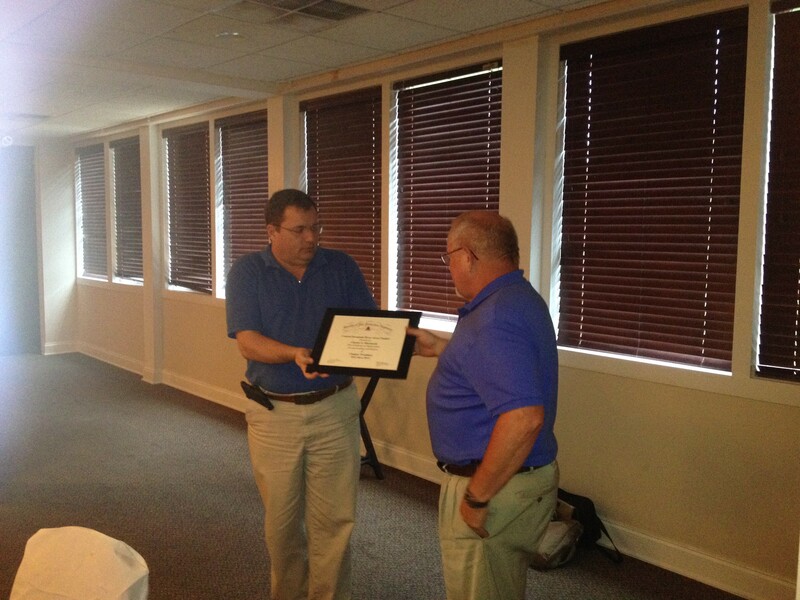 Stan Maciaszek received his Past President's pin and award plaque at the September meeting. 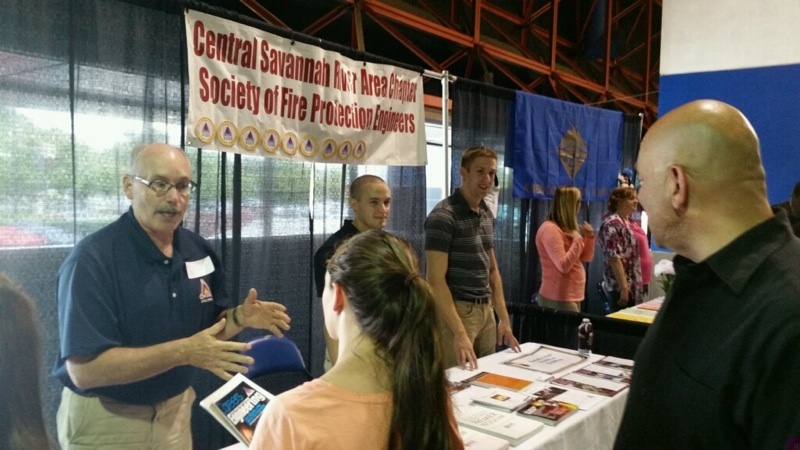 Members of the CSRA SFPE Chapter attended the 2014 College Night in Augusta, GA, to inform high school students and parents about the vast array of careers in Fire Science and Fire Protection Engineering. Tom Allison, Jason Butler, Nick Everett, and Mark Legrand represented the Chapter at this event. Students and parents were given information on colleges that offer degrees in fire protection and career opportunities available upon graduation. Over 6,000 students were in attendance.